Heaven is in Your Genes was written by Patrick Hasburgh and aired on 13 January, 1983. Bill (Robert Culp) has been kidnapped, but is believed to be dead by the Bureau. 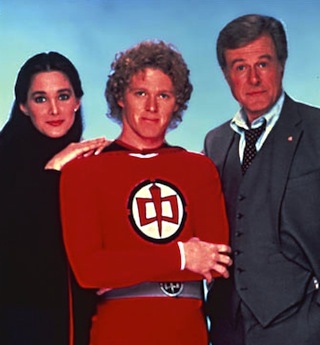 Pam (Connie Sellecca) and Ralph (William Katt) are crushed, but after the funeral, as they are beginning to sort Bill’s things, Ralph holos in on him, and so begins a protracted chase to find his friend. It seems a Dr. Striegel (William Prince) has been conducting genetic experiments, trying to perfect the modern homo sapiens, and he believes Bill is the key, with his near perfect bureau record (thanks to Ralph’s help) and is going to use Bill’s genetic structure to create a new man! His past experiments have not turned out so well.. Meanwhile, Ralph tracks his friend through Mexico, where after trading multiple shots of tequila and arm-wrestling with the jammies on, he finally learns where his friend is, and sets off to rescue him. 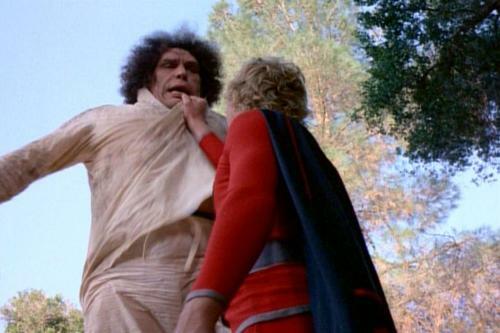 But before the episode is done, one of the experiments will escape (a surprise appearance by Andre the Giant), Ralph has to save Bill (again) and face off against the monstrous experiment! It’s fun and goofy, and the story plays loose and fast, when it could have been played a little darker and more emotionally. Oh well. The next episode on the list, Live at Eleven, just felt too weighed down in everything going on, and was another one that could have been really good. I keep thinking if done now, and updated for today’s world, this would be a killer episode! Written by Babs Greyhosky, it aired on 20 January, 1983. The story follows a news anchor, Henry Williams (William Windom), who is forced into retirement, but is using the opportunity on a dual front. He’s going out with what may be his biggest multi-part story yet, an expose on nuclear power, and power plants, and he’s beginning to throw together his political campaign for a run at the presidency. To add weight to the broadcast as well as his presidential agenda, he’s arranged for a terrorist attack on a power plant during his final broadcast. When Ralph foils one of the attempts on the power plant, he is exposed to some plutonium, which grants him a new, if temporary power… he can influence others by simply pushing a thought into their mind. He’s well aware that he takes advantage of it on the home front, and both Pam and Bill get tired of it pretty quick, but when it seems Williams is going to get away with it, that power, even as its fading may save the day. We get a look inside Ralph’s classroom, for the first time in a long time in this episode, and while there is no Tony or Rhonda, both Paco (Don Cervantes) and Cyler (Jesse D. Goins) make an appearance.